I visited CountryHouse. It's on a very busy corner not close to my home, but it was nice. They had very individualized activities. The lady that toured us was wonderful. It was very clean. There was a common area, and the dining area was good. The best way to get to know a community is by scheduling a tour. 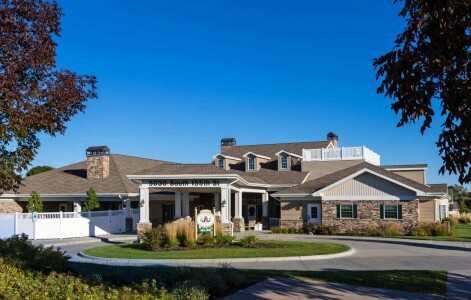 See the facilities, meet the staff and residents, and get a feel first hand what it's like to live at CountryHouse – Omaha Memory Care. So long as you are living, you are on a journey - and there remains ample opportunity for joy and for wonder. That is our philosophy here at CountryHouse, and it guides everything we do on behalf of residents. We will not settle for providing a place for people just to grow stagnant. Instead, we seek to make every part of everyday truly engaging to the residents who stay with us - providing them with real joy and fulfillment..
Each house has gracious dining rooms, comfortable living rooms, and bedrooms clustered in quiet wings. There's a hands-on kitchen for residents to participate in simple food preparation activities. The residential layout enables friends to enjoy socializing together... or find peaceful seclusion. In addition, circular pathways encourage barrier-free walking, both indoors and out. Amenities also include suite choices, a family dining room, salon/spa, secured entries, Wellness Office, spacious gathering rooms with fireplaces, and an enclosed courtyard with patio, gardens and water feature. Families enjoy visiting in the beautiful and comfortable common areas.